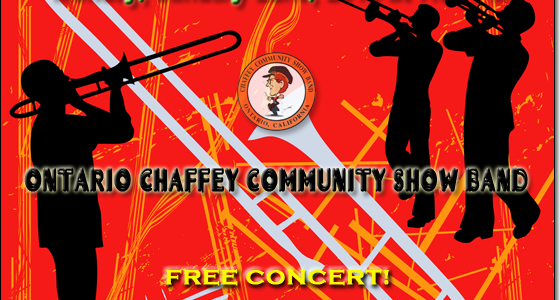 The Ontario/Chaffey Community Show Band is proud to present “Big Band Swing” on Monday January 22nd at 7:30 p.m. in Merton Hill Auditorium located at the corner of 5th Street and Euclid Ave on the campus of Chaffey High School in Ontario. Early birds are invited to come at 7:00 p.m. to enjoy complimentary cookies and Starbucks coffee and listen to the “Woodwind Celebration” in the lobby of the auditorium. Admission to the concert is FREE. The concert will feature an exclusive repertoire of music from the Swing Era highlighted by the outstanding musicians of the Show Band and the exciting Harmony Sisters, a local vocal trio that specialized in in music from the Big Band Era. Also featured are Show Band Trumpet player Larry Cariato and Trombonist Steven Osorio. The Show Band will be featured in a number of popular selections from the 40’s including Benny Goodman’s “Sing, Sing, Sing,” and “Stompin’ at the Savoy,” and Duke Ellington’s “Take the ‘A’ Train” and “In a Sentimental Mood” featuring Larry Cariato. Show Band Trombonist Steven Osorio will pay tribute to George Roberts, the late bass trombonist from the Lawrence Welk Band, by performing a special medley of tunes recorded by Roberts in 2009. Special guest artists are The Harmony Sisters: Beverly Crowe, Stacy Rosen-Sturgis, and Show Band Concertmaster Chris McAleer. They have been singing together since 2002 as the vocalists for the Bill Blanchard Little Big Band. Bill loved the music of the famous female trios like the Andrews Sisters and other similar groups and arranged the delightful harmonies that are performed by The Harmony Sisters. The four numbers from the library of Bill Blanchard include: “Walking My Baby Back Home,” “You Took Advantage of Me,” “It’s So Nice to Have a Man Around the House,” and “On the Sunnyside of the Street.” Each member of the trio has a unique individual style and will also perform as a soloist on the concert. Every January the Show Band honors the late stage band director Lou Dokken, by presenting four scholarships to brass musicians who attend schools in the Ontario Montclair School District. Each student is selected through an audition process conducted by their teachers and are invited to perform their audition piece during the Show Band concert. In addition, each will be awarded a $100 Scholarship sponsored by the Noontime Kiwanis Club of Ontario.